Some people draw to relax. I’m never quite sure whether I do this or not; I don’t think I do. I know I don’t deliberately pick up a pen and a sketchbook and think, ah, this is going to really help me unwind. No. I wish it were that easy. But – then again – perhaps that’s not what people mean, by saying that drawing helps them relax. 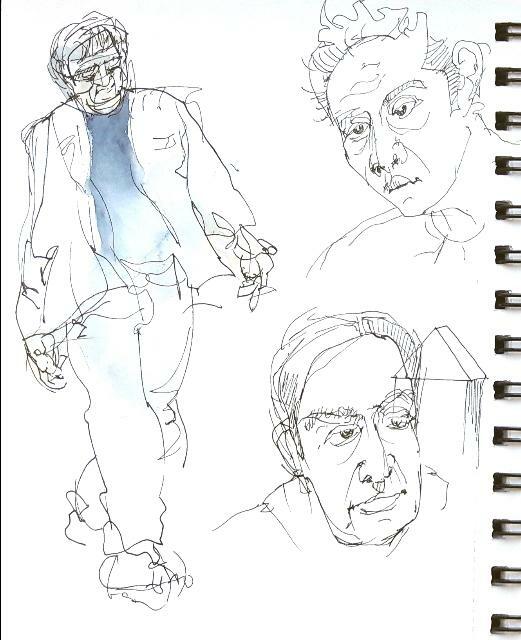 Drawing takes energy and it can be exhausting, but it does bring me into a state of focused attention – and that more than anything is what I need, day in day out. But when I’m not well and have very little energy this something of a dilemma. Partly, it’s what to draw. If I found quiet still-life drawings of flowers or fruit really got me going it might be easier, but I don’t generally get excited by flowers or fruit, it’s just not compelling enough as a subject and I can’t bring myself to start, especially if I’m feeling low. What I find totally absorbing is things that move, and that usually means people or animals, (quite why this is I don’t know) – but give me the chance to watch someone at work, or hanging out with other people just holding a conversation, waving their hands about occasionally, doing something not too impossibly fast – and I’m hooked. Once I start drawing I’m lost to everything else. Pain melts into the background. Tiredness doesn’t count. It’s always been this way. So if I see anything going on outside that I can sketch from the window, I’m engrossed. This warm weather has brought people out of doors to stand around and talk to each other in the street, or chat over the fence. I can try to guess the conversation (!) and just enjoy understanding what’s happening by looking at body language, learning about people by watching how they stand, what they do with their arms and their legs and their heads. And then, if I there’s no live action, there’s always the TV (the sketches on the left hand page were done while watching a film). 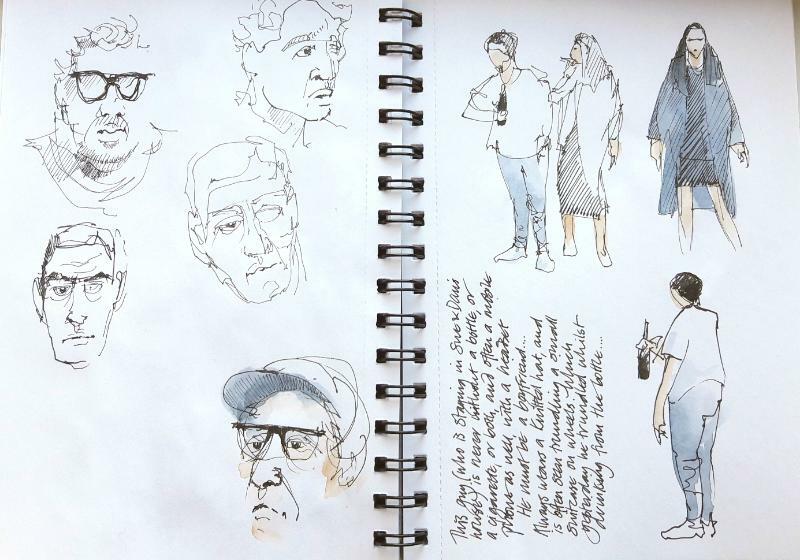 Now, if I could figure out a way to find flowers as exciting as people, I’d be able to get this stimulating-connecting-sketching thing to work any time I look out into the garden. If only flowers moved.